When guests and their families are trying to plan the perfect vacation to the Florida Keys, they should keep a day open for this adrenaline pumping activity. The Watersports Partyboat is a great way for guests to see unique sights just off the coast, one normally would not see. Plus with all the water activities packaged into the deal, it is much more cost effective. 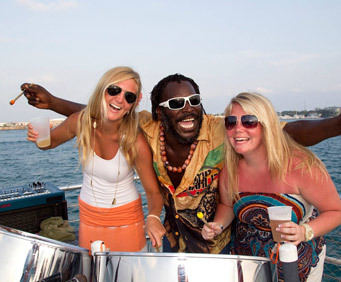 The Partyboat tour lasts approximately 6 hours. Guests will be be served lunch. Lunch choices include bbq sandwiches, chicken, hamburgers, side dishes, and more. Guests 21 years of age and older are welcome to purchase the alcoholic beverages. The tour guide on the boat will educate the guests about the sights around them and answer any questions they have during their cruise. Guests will see a shallow shipwreck up close and learn the history of what happened. Once the Partyboat reaches its destination, the crew members will allow the guests access to the water slide, speedboat, water skiing, knee boarding, or sail boating. The guests are also welcome to snorkel above the shallow shipwreck. Guests and their families can purchase this fun-filled activity in several different ways. If the guest or members of their family of questions regarding the tour package, they are welcome to contact the customer service number provided. When planning a vacation to the Florida Keys, make sure to leave a slot in your schedule open for this adventure. This adventure will bring guests and their families memories to last them a life time. Guests can call or book anytime. 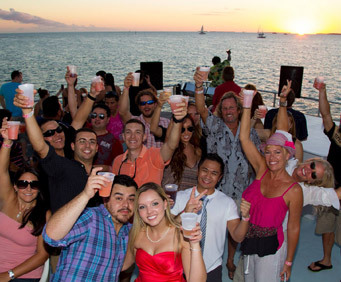 If you love water sports and having fun in an island paradise, look no further than this Key West water-sports party-boat cruise. All the major water sports are available in one place, for one cost, complete with a BBQ lunch, snacks, draft beer and soft drinks. What could be more fun in the Florida Keys? A large catamaran will take you out to a sunken, shallow-water shipwreck, where you can enjoy several water activities: riding a WaveRunner, snorkeling, riding a banana-boat, kayaking, sailing a sunfish sailboat, windsurfing, water-skiing, knee-boarding, paddle boarding, sliding down the mini slide or giant slide or just floating on a raft. After taking off from the Key West seaport, your water-sports party-boat adventure begins. You'll cruise out to a shallow-water sunken shipwreck, where the captain will stop and you can start participating in whichever water sports and activities you'd like. Ride a WaveRunner through the waves. Snorkel or kayak above the shipwreck. Try your hand at windsurfing. Show off your water-skiing or knee-boarding skills. Laugh and scream on a banana-boat ride. Sail a sunfish sailboat. Or simply lounge on a raft and soak up the sun. A BBQ lunch of hamburgers and hotdogs from the grill is included, as are soft drinks, a veggie tray, chips and draft beer (beer available on the return journey only). For the truly adventurous, a parasailing experience can be added to this tour for only USD$21.50 (payable direct).